The Centre for School Mental Health is acknowledging Bell Let’s Talk Day during the week of January 29 th to February 2 nd, 2018 to recognize that conversations about mental health span longer than one day each year. Bell Let's Talk Day is Wednesday, January 31, 2018. Developed in partnership with Dr. Heather Stuart, the Bell Canada Mental Health and Anti-stigma Research Chair at Queen's University and Bell Let's Talk, there are 5 simple ways to help end the stigma that keeps too many who struggle with mental illness from seeking the help they need (source: https://letstalk.bell.ca/en/ways-to-help). Our Centre's goal is to recognize these strategies in a way that facilitates discussion and gives personal, usable resources to faculty, staff, students, community members, friends, and family. On Monday, January 29 th the Centre will be kicking off the week with a Word Cloud project. The word cloud will include positive messages and terms about mental health to reframe the way we speak and think about mental illness. 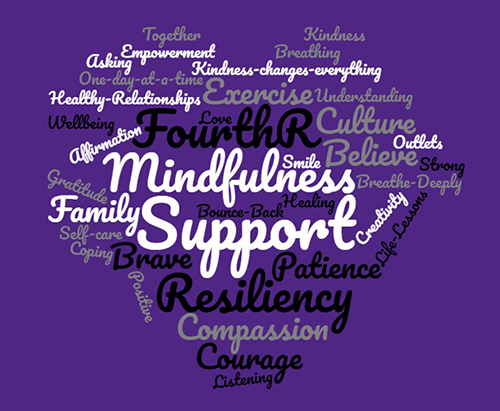 Please join CSMH in creating this word cloud by emailing 2-7 words that you believe should be included to Nicole Bullock at nbulloc@uwo.ca. What is a word cloud? Word clouds are graphical representations of word frequency that give greater prominence to words that appear more frequently in a source text. The larger the word in the visual the more common the word was in the document(s) (betterevaluation.org). 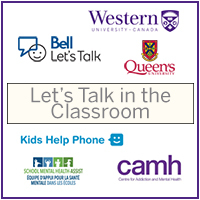 Let's Talk in the Classroom - the purpose of this program is to prepare teachers to effectively and confidently teach and talk to their students about mental health. This online program is available to Grade 7 and 8 teachers at participating school boards. Reach out to your Mental Health Lead for more information! Learn more about this course by clicking the image below. 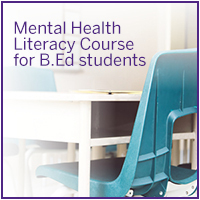 Mental Health Literacy for B.Ed students - this program is the first mandatory mental health literacy course in Canada for teacher candidates! Learn more about this course by clicking the image below. Listen and Ask - Wednesday, January 31...Bell Let's Talk day! And... For every applicable text, mobile and long distance call, tweet using #BellLetsTalk, Bell Let’s Talk Day video view on social media, use of the Bell Let’s Talk Facebook frame or Snapchat filter, Bell will donate 5¢ to Canadian mental health initiatives. Be Kind...to yourself. Self-care is not selfish. Our MindUP for Young Children project builds on MindUP ™, a universal school and mindfulness-based education program that incorporates social-emotional learning into lessons. The Focus on Breathing Practice is taken from the MindUP ™ program where the activity focuses on learning to breathe in a way that helps your brain to think more clearly. Sit down in a comfortable position. Close your eyes or look down at your hands. Take calm, slow breaths. Gently breathe in through your nose, then let go of each breath. Keep your shoulders relaxed. Picture the air coming into your body and going out again. If your mind tries to think about other things, bring your attention back to your breath. Feel your stomach rising and falling. Keep your belly soft and relaxed. Open your eyes slowly and take another slow, deep breath with your eyes open. - How did you feel as you breathed in and out? - What did you notice about your breathing? - How did you keep your mind focused on your breathing? Bell says... Simple kindness can make a world of difference. Whether it be a smile, being a good listener or an invitation for coffee and a chat, these simple acts of kindness can help open up the conversation and let someone know you are there for them. Remember, be kind to yourself and others. Learn more about the Bell Let's Talk initiative!